The sixteenth at Pierce Lake is a 540 yard par 5. Teacher’s Comments: A tough course that will test your skills. 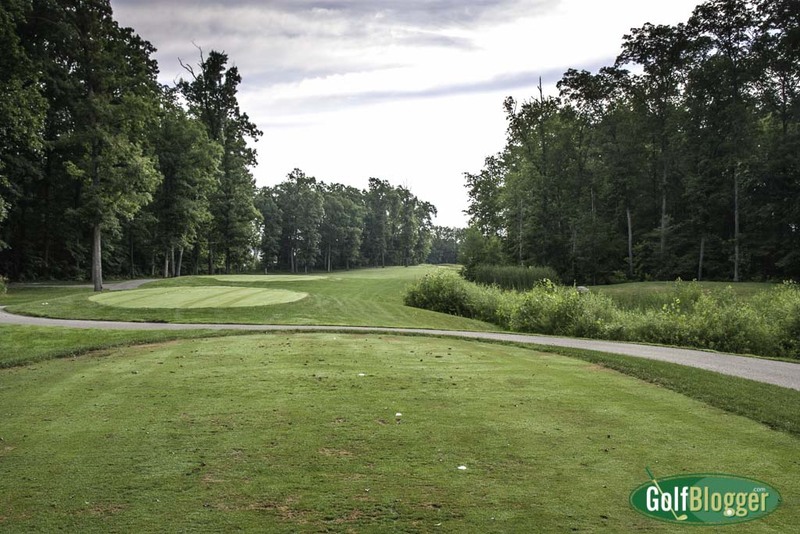 If you want to test your skills as a golfer, look no further than Washtenaw County’s Pierce Lake golf course. The woods, hills, valleys, creeks and swamps—and there are plenty of swamps—require good shotmaking and imagination.. The course measures 6917 yards from the back tees and plays to a rating/slope of 72.5/135. Fortunately, there are five sets of tees—the mid tees measure 6152 with a 69.8/127 rating/slope. A friendly word of warning: do not overplay your hand. Use the tees that reasonably fit your game or it will be a very long day (and you will lose a bunch of balls). The front nine is probably the easier of the two, as several of the holes are laid out across open fields. Water and swamps are present, but they are avoidable. Plan to score on this side. The back nine, however, is cut through a swampy forest. The holes are tight and unforgiving. Forced carries are the order of the day. Miscues will result in lost balls. Plan to hang on on the back nine. The back nine is a bit unusual in that it has three par fives and three par 3s. For shorter hitters, the second shot probably will take you over a liver of lake, and some maliciously placed fairway sand traps. I like that shot because it lets me show my prowess with my R7 TP 3 Wood. The green is protected left and right by bunkers and is nestled in a crescent of trees. It’s got a bit of a cloverleaf shape, and so you must be sure to hit the correct corner. The par 5 sixteenth is also a great challenge, as it has two bunkers in the middle of the fairway in the landing area. You might be tempted to try the ball left or right, but that puts you in danger of heading into the trees. Either be sure you can fly the bunkers, or lay up on your tee shot. The finishing hole is a par 3, but its one of the toughest I’ve seen, requiring a 191 yard shot across a swamp to a green set hard against a hill. Course conditions on the day I visited were good. In the sun, the fairways were a little hard, but there were no bare spots. In amongst the trees and swamps, I was surprised at how well drained things were. Most swampy courses have wet spots in the low areas – -but not this one. I saw only one bad spot on a green—and that was in total shade, so it may be forgivable. Tee boxes had been well used, but the divots were filled in with sand and seed. The twelfth at Pierce Lake is a 224 yard par 3. The thirteenth at Pierce Lake is a 414 yard par 4. Pierce Lake's fourteenth is a 184 yard par 3. The marker beside the 18th at Pierce Lake quotes this review!